The premise of the film is unsurprisingly simple. A team of elite, highly-trained mercenaries known as The Expendables are sent into South America to overthrow a ruthless cold-blooded dictator. But once the mission begins, they discover a plot far more sinister than they were led to believe. I won't lie, when this project was originally announced, I was jumping with joy. But upon watching the end product, I felt slightly conned. I was expecting Sly teaming with Arnold Schwarzenegger, Bruce Willis, Dolph Lundgren and Mickey Rourke for a dream team of epic proportions. Unfortunately Stallone chose to pair himself with Jason Statham (was Vinnie Jones busy? ), Jet Li, Randy Couture and the dad from Everybody Hates Chris. All sarcasm aside, the cast performed competently with the ham-fisted script they were given. Just a shame, the stand out scene of the entire running time was the five minute meeting with Schwarzenegger, Stallone and Willis. The chemistry was wonderful, and the inside jokes raised a smile or two in the audience. If you love your Predators, Cobras, Terminators, Universal Soldiers, Robocops, Tango and Cash then the nostalgic experience of The Expendables is certainly for you. However, unlike two very similar films released this year, The Losers and The A-Team it didn't quite have the acting panache to go along with it. What the film did do however - unlike the aforementioned films - was turn the blood and gore factor up to 11, making for some stupendously awesome yet completely absurd death sequences. Unfortunately The Expendables often pales in comparison to more modern and inventive action films, such as the Bourne Trilogy and even the latter day entries to the Bond franchise. Some might call this an unfair statement, but even compared to the films the older members of the cast were making 'back in the day' this film is indeed quite average - I was also deeply disappointed at the lack of memorable one-liners. Obviously I can appreciate Stallone wasn't aiming for Oscar glory when writing and directing The Expendables and in all honesty it was only a Jean-Claude Van Damme (who turned down a role because his character apparently 'lacked substance'?! ), Steven Seagal (conflicts with the producer), Wesley Snipes (umm...prison? ), Kurt Russell (wasn't interested) and Carl Weathers away from being a genuine contender as a cult classic B-Movie. But alas it was not to be and we're stuck with 'Stone Cold' Steve Austin and various other actors of similar elk, frankly, very few people genuinely care about. If you like your action films really really dumb, and I'm not even talking 'Michael Bay dumb' then by all means, get the lads together for 100 minutes of no holds barred, unadulterated, over the top carnage and violence. Just a shame the final cast list was largely forgettable and the plot was so painstakingly average, it made Commando look like Shakespeare. Do yourself a favour and wait for the DVD folks, which is what the film should have been released on directly in the first place. Commando, Rambo, Terminator, Die Hard, Tango and Cash. 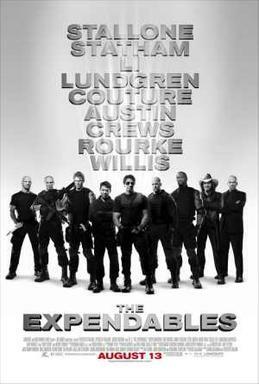 The Expendables is in cinemas everywhere from today. Some of the greatest stars bands together in an action movie like no other, and it will surely make all your teeth fall off due to sheer manliness that'll make you go to your dentist to get them all reattached again. From Stallone and Lundgren's old school way of action, Jet Li and Statham's fast paced style of fighting, Couture and Austin's backgrounds on MMA and wrestling, to Terry Crews' humor, this is the whole package! When I first watched it in theater in Knoxville, TN, I was at awe at Mickey Rourke's monologue and the level of action it shows. I think the movie deserves a star higher since it kinda sticks to the 'pure-action' genre, free from those drama, comedy, and fantasy that we always see in movies today. Yes, my husband and I watched the movie online and have the same opinion regarding the Expendables not being on par with the cast's past projects but the movie is good nonetheless. And Terry Crews surprisingly performed well too! With that sudden entrance and that big automatic shotgun, he really brought the house down! While the DVD isn't out yet, guess I have to stream it since you can watch free movies online easily.